An Egyptian company founded in 2006 and registered with the Egyptian Chamber of Commerce. Focuses on energy efficiency and sustainability. Offices in Cairo and UAE. ALFA HB LED: Polish partner supplying luminaire parts. 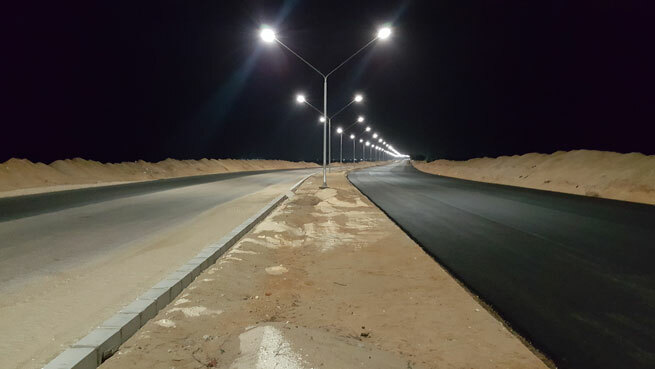 Hammer electric S.A.E was given the job of modernizing Egypt’s street lighting luminaires as part of the government’s goal to generate 20% of the country’s energy from sustainable resources by 2020. The first step was to replace the old sodium-vapor lamps with LED lighting and to install completely new LED luminaires in rural areas. In places where access to the national grid was not available solar generators were installed to provide power for the new LED luminaires. Other requirements included color temperature of around 4000K, a spotless light pattern and lower energy consumption with a controllable light dimming solution. Research was carried out into existing road layouts together with a study of available LED technologies. The huge road network, pole configurations and unstable voltages – that can drop to 160V or less in some regions – all posed challenges to achieving uniform and stable lighting. LEDiL optics were able to solve the first part of the problem resulting in more than 90% of road surfaces being lit evenly and efficiently. Drivers from OSRAM and PHILIPS – able to operate from 120V – solved the unstable voltage problem. All the LED luminaires – both for the replacement and new construction – were designed and assembled locally in Egypt. Compared to the old sodium-vapor lamps the energy savings were very clear. In addition the new lighting is uniform, has low CAPEX and requires minimal maintenance. Using 100% solar energy in some rural areas means truly ecological and efficient lighting. Hammer Electric S.A.E have received a lot of praise for the results from this project – something that makes them and LEDiL very proud.